The 2018 Homecoming Music Gala drew in Goshen College community members from all over the country on Oct. 6. The yearly gala is always a well-attended event because Chamber Choir, Men’s and Women’s Choirs and the orchestra perform. Deb Detwiler, a GC music professor, commented that the event has been a Goshen College tradition since before she joined the faculty. Dr. Doyle Preheim, Detweiler’s former mentor and predecessor, and Dr. Lon Sherer founded the gala. They were faculty members of the college during the 1970s through the early 2000s. The Homecoming Music Gala is the first concert of the year that combines performances from all of the three choirs and the symphony orchestra. Jose Rocha, the orchestra director, explained how the orchestra goes about rehearsing for the music gala. For Chamber Choir, one piece was specifically relevant to issues in the current political climate. The first song, “To the Mothers in Brazil: Salve Regina,” is about the separation between mothers and their children in war-struck regions. This piece was chosen with consideration to the separation of immigrant families at the border between the United States and Mexico. “[I] featured it as a way to remind us that many families are still unlawfully separated,” Detwiler noted. Another piece that the Chamber Choir sang was a hymn by American composer Alice Parker. Parker will be performing on campus in a free concert on Nov. 18. It is open to the public. The piece was composed by Henry Breneman Stewart, a 2014 Goshen College graduate. This piece was full of emotions that are felt while on SST and each audience member felt and saw it uniquely. That was the beauty of this shared experience and its translation into music. 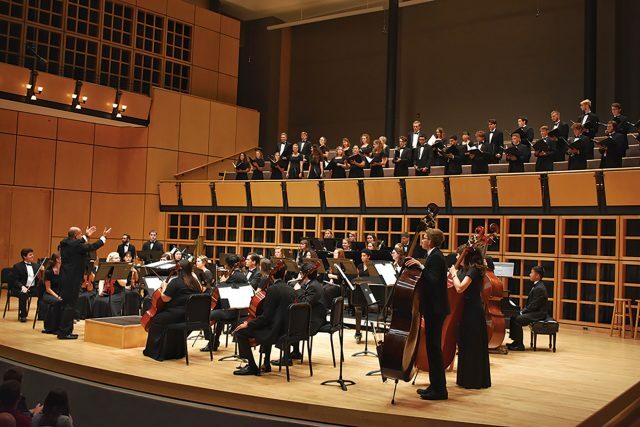 On Nov. 2, the symphony orchestra and Chamber Choir will take to the stage for another concert. Students can receive convo credit for attending.